I mentioned in my last blog about the Inspirational Women (Audio) Series – this is one of the most exciting projects I have worked on yet. The second interview to go live is no exception. I am delighted to share my podcast interview with the co-founders of AmaElla Lingerie. In this interview I had the pleasure of speaking with Lara Sans Gill and business partner and best friend Julie Kervadec, who met one another in Spain whilst studying their masters. They came up with the idea for an ethical fashion business and turned AmaElla (ethical sustainable and organic lingerie) into a reality. During the interview we talk about life as business partners and best friends, what helps them manage the difficult times – as well as their top 3 tips and tricks for staying on top of it all. They are both elegant, ethically minded, caring, supportive of women, encouragers of female confidence and embracers of female beauty. All of this is reflected throughout their business, their ethical lingerie designs and branding. 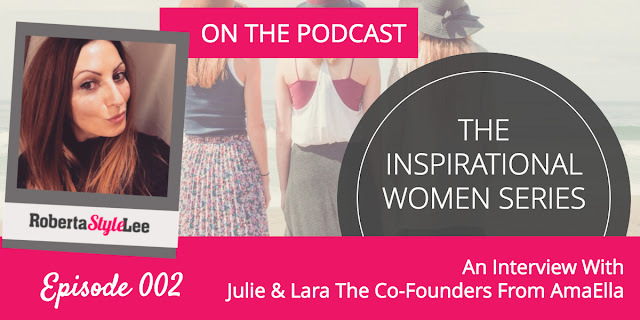 I’m extremely honoured to have had them on the Roberta Style Lee Podcast – Inspirational Women Series they are both more than worthy of the hashtag and title #InspirationalWomen. Future Business Centre – Fashion Ethics Party Anyone? Well, that’s it from me. I would love to hear your thoughts – please leave any comments below.